Our four hens have grown old and their egg production has dropped off. We have not seen an egg for 6 weeks and it is likely to be another four to six weeks before they start up meager laying with the spring. 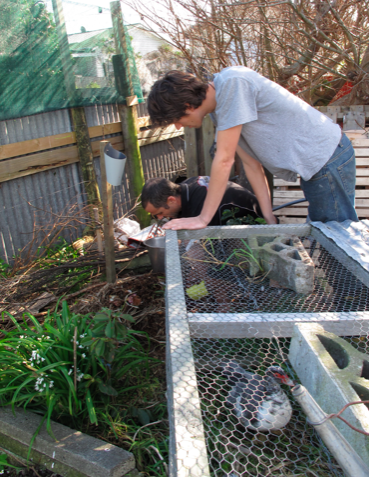 Instead of feeding them through the winter, we decided to eat them and then buy layers in the spring. Here is a brief description of our process. 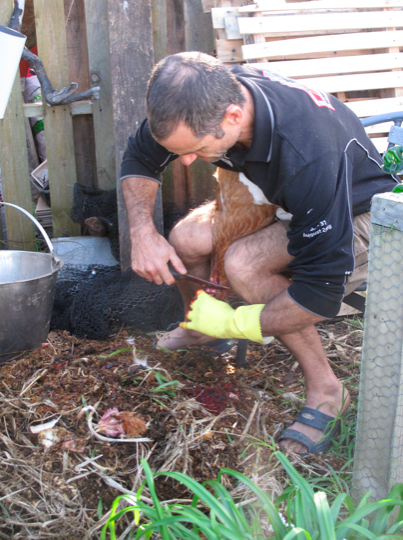 * Please note there are some photos that show the humane killing and processing of chickens. First, I like to carry chickens by their feet. I’m told when the blood rushes to their heads that they calm down. I have found this mostly to be the case. 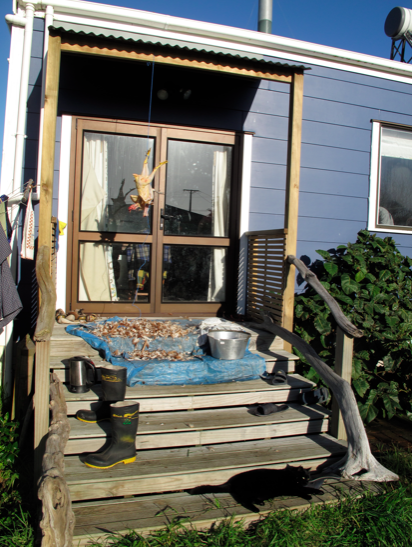 I made a killing cone and mounted it over our compost pile, but then we discovered a youtube video of a woman slitting a chicken’s throat without a cone, but just squeezing it gently between her knees. We decided to go with this option. In the video, she gently massaged the neck where she would make the cut. She also held the beak and head in an overhand grip, as you can see below. My index finger was on her beak a little like the trigger of a gun, and my thumb firm but gently head the back of her head so she would not squirm at all. I pulled just enough tension on her neck to keep it straight, and so that she would not wriggle. I’m not sure how the muscovies felt about witnessing this event, but they happened to be next to the compost pile at the time. It took only about a minute for the blood to drain from the neck. 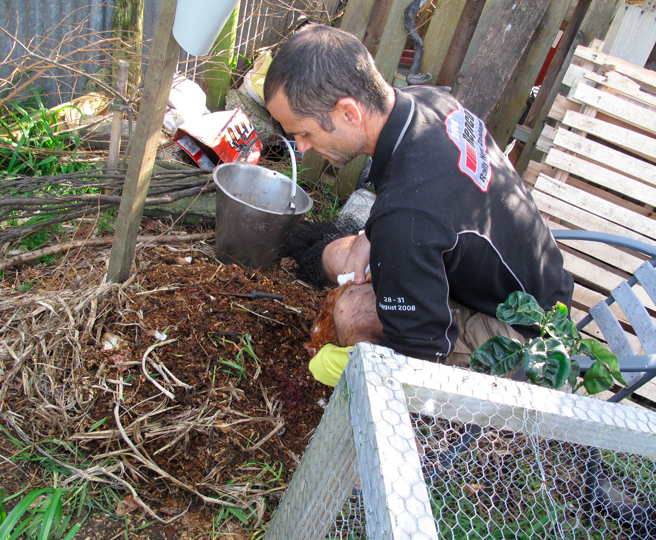 We don’t have pictures of the plucking, but here is where we did it. 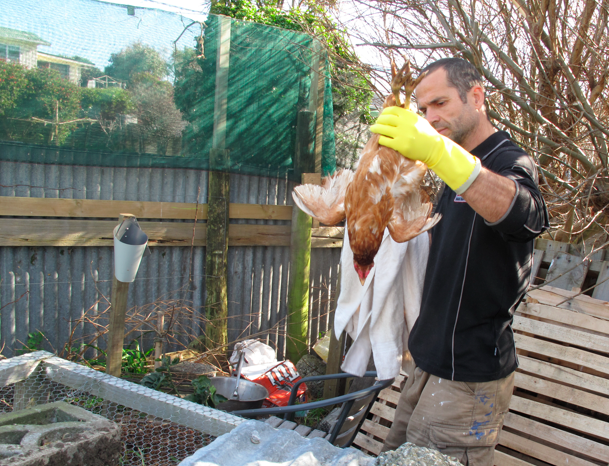 We dunked the birds in hot water and then hung them up to be plucked. 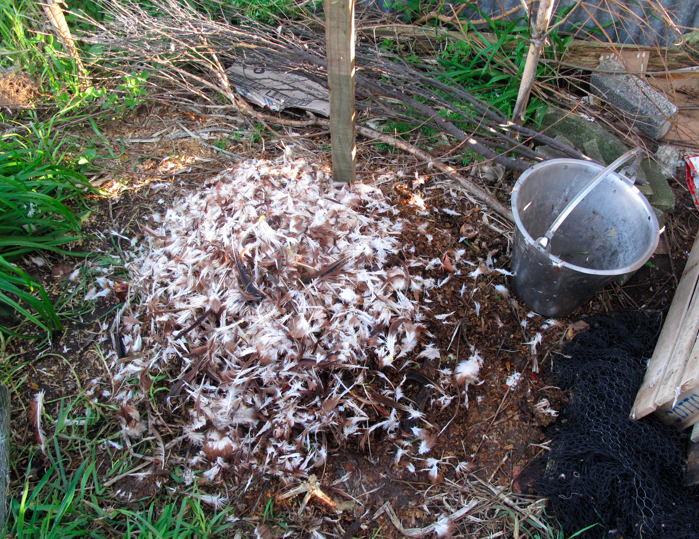 We collected the feathers to put into the compost. 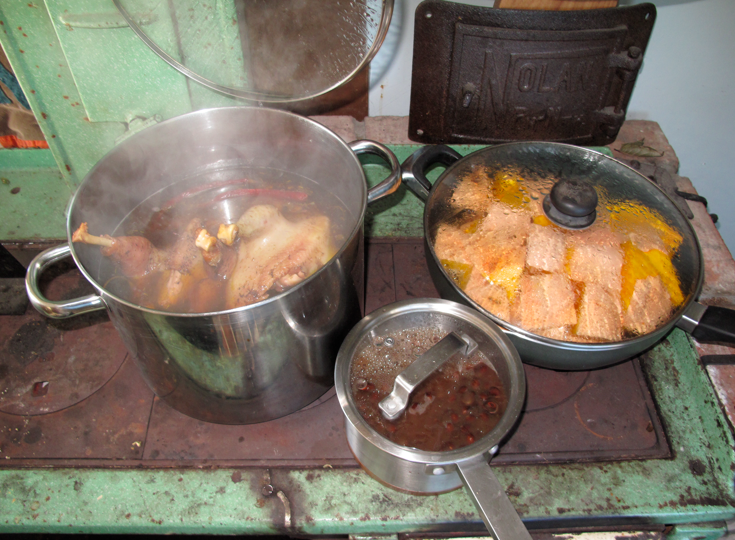 Jessea gutted the birds and then we put them in a pot with homemade veggie stock for a long boil. You can also see our homegrown pumpkins and homegrown blackbeans cooking. The whole process took about two hours – faster than I would have expected. 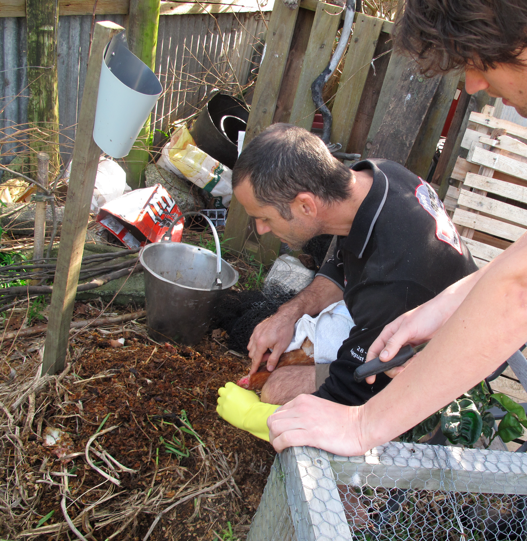 Mind you, we had three people working together on 4 chooks. The entire process was very calm. There were no freaked out, clucking chooks or people. I think the mindful processing of these birds is about as good as it gets.